Background Antibiotics are the most frequently used drugs among hospitalised patients. Antimicrobial resistance is a major health issue and therefore antibiotic consumption should be under strict surveillance. Objective To evaluate the use of restricted antibiotics in an academic hospital in Romania. Methods Retrospective evaluation of the use of 11 restricted antibiotics issued based on the antibiotics formularies for the year 2012. Therapeutic guidelines and the summary of product characteristics were used for the evaluation. The appropriateness antibiotics use was verified, according to three main criteria: appropriate indication (type of treatment, localization and type of infection), dose and duration of treatment. Descriptive statistics and multiple logistic regression analysis were performed. Results 664 prescribing formularies were analyzed, of these 319 were from the intensive care unit (48.04 %). The most prescribed antibiotics were vancomycin (171, 25.75 %), imipenem (151, 22.74 %) and meropenem (116, 17.47 %). Overall, 285 prescriptions (42.92 %) were considered inappropriate. Vancomycin, meropenem and imipenem were prescribed inappropriate in 49.71, 46.55 and 44.06 % of such cases. Of the total 285 prescriptions deemed as inappropriate, for 49.82 % the dose was incorrect, 20 % were inadequate in terms of treatment duration and 15.44 % were wrongly indicated. Inappropriate use was significantly higher among empirical prescriptions than the documented ones (69.75 vs. 30.25 %, p < 0.001). Multiple stepwise logistic regression identified that the duration of the treatment was significant for inappropriate antibiotic use (p < 0.05). The risk of inappropriate use in the case of empirical prescriptions is higher than for documented prescriptions (OR 5.78, p < 0.001, CI 3.65–9.15). Conclusions the results suggest the need to intensify the control of the use of restricted antibiotics. 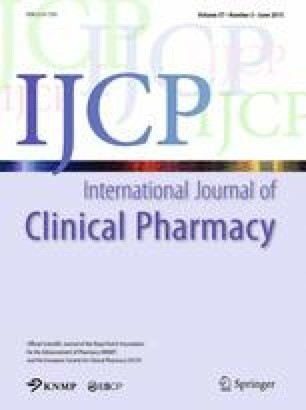 The implementation of drug formularies in hospitals and the involvement of the clinical pharmacist may ensure rational antibiotic therapy. The authors would like to thank the head of the hospital pharmacy, Ms. Carmen Span for granting us access to the prescription formularies. European Centre for Disease Prevention and Control. Surveillance of antimicrobial consumption in Europe 2010. http://www.ecdc.europa.eu/en/publications/publications/antimicrobial-antibiotic-consumption-esac-report-2010-data.pdf. Accessed 10 Nov 2014. National Agency for Medicines and Medical Devices. http://www.anm.ro/anmdm/. Accessed at 10 Nov 2014.